Peru defender Carlos Zambrano has hit out at Argentina stars Lionel Messi and Gonzalo Higuain in the aftermath of Tuesday’s 1-1 World Cup qualification draw. Zambrano, who netted the opening goal in the encounter, feels that the Barcelona forward and his Real Madrid colleague did nothing but complain throughout the match, and looked frustrated all game long. 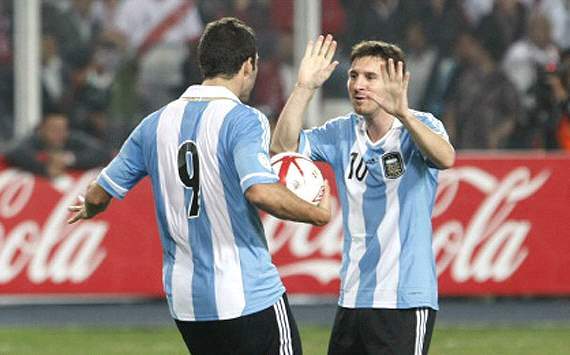 “Messi and Higuain are little girls. All they did was complain about everything all game long,” Zambrano was quoted as saying by Depor.pe. “Messi must have been scared, because he didn’t do much. “Higuain attempted to provoke me throughout the game, but I took the high road and didn’t take the bait. I never fell for his tricks. Argentina sit atop of the table in the Conmebol World Cup qualification group with 14 points from seven games, while Peru have collected seven points from as many matches. This entry was posted in News on 14/09/2012 by mirsinho.